The custom Camo 5 Pc BBQ Set includes FDA compliant stainless steel instruments. TruColor™ Direct Digital Print technology is a unique patent-pending digital print process that allows you to print your logo in vibrant color directly on to this item. There is no limitation with the logos, artwork or colors that can be printed with TruColor™. Impress your clients with how vibrant their print can be, whites are bright, yellows and reds will pop. TruColor™ technology has the capability to print standard one color or multi-color logos, photorealistic, multi-color logos with tight registration and logos with half tones or gradients. 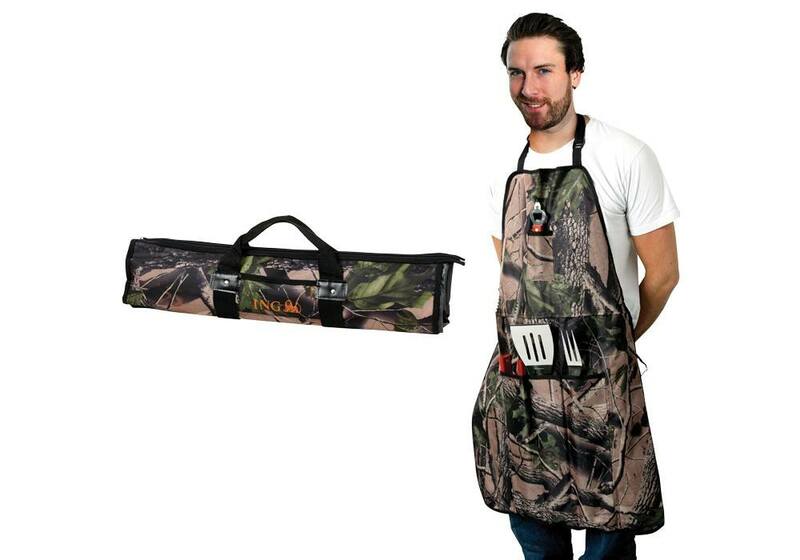 Throw enjoyable barbeque parties at home with this Camo 5 Pc BBQ Set. This is an essential set for every home and catering service. The barbeque set includes FDA compliant stainless steel and wood handled tongs, fork, spatula, bottle/can opener. 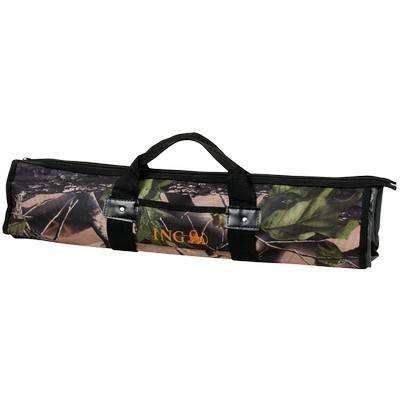 When not in use, the apron can roll into a neat carry tote. 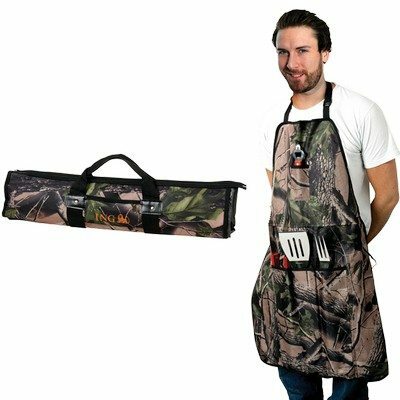 The apron includes a front slash pocket for additional storage, and a top carry handle for easy transport when not in use. The set is compact and easy to carry around. It is a good addition to your existing cutlery. This barbeque set can be further customized with your company's logo to help promote your brand further.